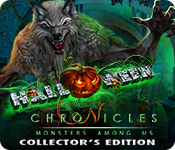 Halloween Chronicles: Monsters Among Us Collector's Edition is rated 3.9 out of 5 by 24. 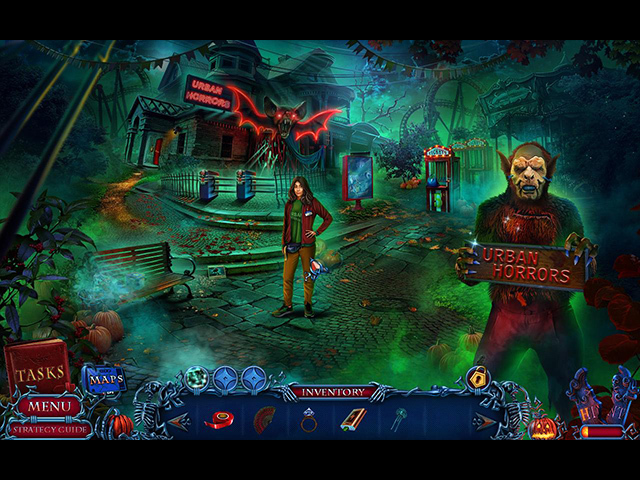 Rated 5 out of 5 by Ndwelt from Another Halloween Fiver This game takes off right at the beginning and moves right along, pulling you into the story. In my opinion the artwork and colors are snazzy. Love the Halloween details. Think the collectors edition is worth the price on this one. Lots of collectibles. Stay safe and play games this Oct. 31st! Rated 5 out of 5 by sunnyglow from A HALLOWEEN FUN-FILLED GAME WHICH IS A MONSTROUS SUCCESS! REVIEW BASED UPON THE MAIN GAME 4 Chapters Plus a Bonus Chapter – Strategy Guide: 61 Pages OVERVIEW: Are you ready for a Halloween monster mash-up? You will be dealing with monsters of all shapes and sizes in this game. As an aspiring medical student at a prestigious medical school, you return home to visit your father for Halloween. With the disappearance of your mother, you are concerned about your father. However, this visit will be anything but a peaceful visit with dear old dad. You will discover family secrets when monsters begin invading your hometown. A doll, Harlequin Harvey, is spearheading this invasion to release the Headless Horseman, the master of all the monsters. With camera in hand, you are off to Witches Hill to stop the disturbing clown doll and the Headless Horseman. This will be a family affair. Along the way you will get help from family members, past and present. OPINION: Trick or treat? My favorite developer has delivered an excellent Halloween treat! What a fantastic Halloween delight! This is a LONG game all decked out in Halloween attire, with bats, pumpkins, ghosts and monsters. The story is well-written. The pace is excellent with plenty of activities to keep the player engaged. Monsters are everywhere in this game and the creepy harlequin doll, Harvey is reminiscent of the clown “It” from the novel by Stephen King. Domini always provides more game for the money with long games filled with plenty of collectibles, choice in difficulty of the puzzles, and creatively designed puzzles and HOP scenes. To me, this game is worthy of the collector’s edition designation. Hopefully, Domini will continue this game series as a Halloween tradition. MECHANICS: There are four (4) levels of play including a customized version. There are thirty-three (33) achievements. Collect seventy-one (71) film rolls which, when collected, allow you to purchase items for a boudoir. Also collect fifteen (15) newspaper scraps and fifteen (15) photos of monsters. I found the collectibles easy to locate and there is an indicator bar which alerts you if there are collectibles within the scene. You can choose the level of difficulty for the puzzles in the beginning menu. You can replay eighteen (18) HOP scenes and twenty-two (22) puzzles. There are fourteen (14) wallpapers plus the usual casual art, music and video sequences. BONUS CHAPTER: It is a sequel. It is the week after Halloween and now you must return to college. A present given to you by your father is stolen. Now you must retrieve it before it leads to dire consequences for mankind. HOP SCENES: There are fourteen (14) in the main game. I am impressed with the HOP scenes, which are creatively designed and interactive. This game does not have many lists of items. Most of the scenes are storybook scenes with highlighted items or silhouette scenes. There is a rebus scene and a search-and-replace scene as well. There is one I have not seen before. It is a well-designed HOP scene in which you must complete tasks by searching for items to complete these tasks. You can play a Match-3 game in lieu of the scenes. PUZZLES: This is a puzzle-lover’s dream game! There are twenty-nine (29) just within the main game. There is a wide variety of them as well. My only complaint is that I wish there were more puzzles available to replay. 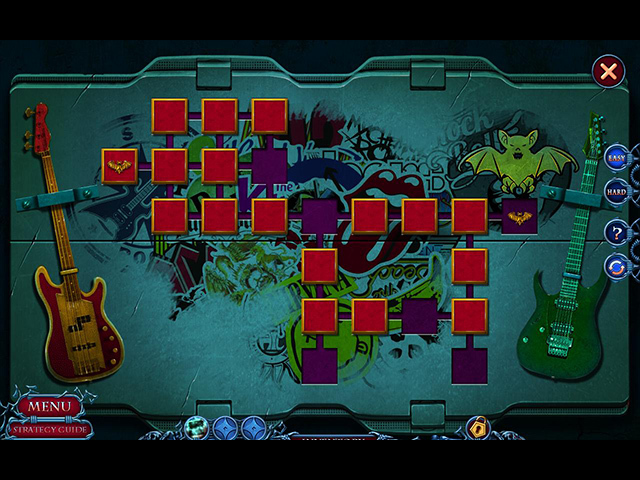 Most puzzles can be played in either an “easy” or “hard” mode. SPOILERS: HERE ARE A FEW OF MY FAVORITE PUZZLES AFTER THE DEMO: A. Deal the deck! Sequence/Mathematical puzzle. On a card table, place cards into proper position based on clues from the cards already on the table. 4X B. Ye old stacking puzzle. Move a series of pieces between three poles so that the pieces which are placed in the middle pole follow a diagram etched into the pole. C. Rock, Paper, Scissors. Beat the computer. Play this game with a skeleton to win. D. Ye old cell puzzle. Turn on all cells within a grid. Clicking on a cell will light all cells surrounding it as well. However, it will also turn off cells which are already lit. E. Paper witch dolls! Switch puzzle. Switch clothing among various witches to provide an outfit for a central witch according to a given diagram. F. Rotating tiles puzzle. Rotate and switch buttons with prongs at the end so that the prongs are positioned as per a given diagram. Prongs on one button will transfer to another when the prong abuts that button. Rated 4 out of 5 by breantrose from Good Enough... I usually try to buy a holiday-themed game every year and this was my Halloween purchase. There weren't enough morphing objects for my liking, but the articles were fun to read. Looking for difficult morphing objects, is one of the things I like best about really good games. The weirdest thing I noticed was the dad. In some scenes, his face looked just fine. In other scenes, he sported a huge, long red scar going down the left side of his face. Why the inconsistencies with his face like that? Why does he have a big scar only sometimes, then others, it's not there at all? Really, really odd. I don't mind going back and forth all over the place to place items at scenes and I always like the Match-3 offer during HOS's. It gives you a choice and that's always good. The mixture of stories was a little weird, but all in all, this was fun enough to play once or twice. Rated 4 out of 5 by dancemom1 from Poor Daddy... Hello friends! As usual, I review mostly on the game play and leave the story to others who can do a much better job than I. It is definitely nearing Halloween and we have many "spooky" games coming out of the woodwork. The graphics in this game are the same as usual for this developer, very nice except a lot of blurring when going in and out of close ups. Colors are very bright but not over powering. Nice to see that we aren't playing in a cloud of smoke for a change. Game play was excellent, with no problems during the demo. Voices are well done and are age and character appropriate. Waiting for the "real" bad guy to show up to see what he sounds like. Animation isn't too bad, although some movements are stiff and choppy. Sound FX are very well done and give you just enough of that edge of your seat feeling to make you know something is about to happen. However, be aware that things do jump out at you. We do have a creepy Harlequin doll that pops up now and then. He'd scare me, even if he didn't talk! HOPs are very well done and varied. We do have a number of highlighted word type HOPs, but still a nice combination, with interactive lists. Scenes are fairly clear and items are not difficult to find. If you don't care for the HOP, switch to the match 3 game. Puzzles, for the most part, are not difficult. We do have some that take time and thought to complete, and can provide a little challenge. We can choose easy or hard for the puzzles as well, for those who want more challenge. I always demo in the easy mode to get a feel for the game, then move to hard when I replay them. We do have my favorite map. Rather than a transport, the map opens and shows you where you need to go. Areas are identified by name and picture. The map also shows you where you have missed a collectible. For more challenge, you can turn this feature off. Collectibles are well done. We have 15 monster photos to find and 15 newspaper articles as well. These items can be anywhere. Some are easy to spot, others you only see a piece of, so be on the look out. We also have 71 rolls of film to find. These are found in close up scenes. They are large enough to see, but easy to over look. These are like finding coins. The more you find, the more items you can purchase in an extra room. Nicely done. I found myself drawn into this story very quickly. It is different, interesting and well done. The demo was over all too quickly for me. I think all levels of players will find this one well worth the price of a CE. I do not give 5 stars easily, and because of the blurring, this one didn't get them either. I did feel is was worth a 4.75. Yes, I am adding this one to my extremely long list of CE games. As always, try it for yourself and see what you think. We all have different tastes in games and you may not care for this one at all. Thanks for the reviews. Play on! Rated 4 out of 5 by Granny_Gruff from The Monsters Are Out and We Get to Hunt Them It's October and Halloween is definitely on the way as we have another new Halloween themed game to explore. You are going home to visit your Dad. You've been away at medical school for most of the year. Dad is a photographer and well traveled. He is excited about your visit, even going so far as to decorate the house and yard for Halloween. Home had been a lonelier place since your Mother disappeared. Before you even get into the house, strange things start happening. Unfortunately things will get stranger and quite dangerous before they get back to normal. Good News: This Domini game includes a variety of collectibles and CE bling along with the interesting story, HOPs with a Match 3 alternative, mini-games, and puzzles. Bad stuff: Once again the colors are over-saturated from the opening green mist outside your cab window to the glaring lakeside at what should have been at twilight but looks more like a carnival scene. Bottom line: For a good solid Halloween themed game, you can't go wrong with this gem with a twist on the save my relative story line. Please try the Demo and see what you think. Rated 4 out of 5 by pennmom36 from I'M REAL...I'M A REAL BOY -Pinocchio Halloween is quickly approaching, and so are the monsters who anxiously await All Hallows Eve! Riverstown, Virginia will never be the same once the Master has been released to walk amongst the living. All hope is not lost yet! You may have been sheltered from the dangerous truth for most of your childhood, sheltered from learning the true identity of your parents, but now that the truth has been revealed, it's time to follow in your family's footsteps. It's time to hunt down the Monsters Among Us! Good news! The overabundance of Blurple colors has not been used in Domini's newest series Halloween Chronicles! The bad news is that Blurple has been swapped with Neon Green, but at least I didn't lose my diary/journal note to a random gust of wind! More good news, I'm not carrying around a large paper map because I have a phone! More bad news, there's no need for magic glasses, but there is a need for a magic camera, does everything have to center around magic items my little origami puppy? In all seriousness, this is a really good Halloween themed game, and more of a G-rated light-hearted non-spooky game than last weeks similar themed Halloween game. Personally, I prefer the spooky, creepy genre, but I'm positive this game will receive rave reviews simply because it is less frightening. This is a very long game, another feature Domini is famous for, but for me personally, it's a little too stretched out. I find the added filler tasks to become tedious because they don't add anything to the storyline. The tasks are just added to make the game longer but at the same time, it can become boring when you're just doing the same thing over and over. If this game were a little creepier, less neonish in color, and more condensed, it would be a 5-star game in my eyes. The Hidden Object Scenes are mostly variations of Keywords in Sentence finds as Silhouetted Shape finds, Listed Item finds, Multiple Item finds, and Combination Silhouetted Shape finds (the product of 2 items combined) There are several Zoom Zone Hidden Object Scenes available that usually require finding 6 or more objects shown as Silhouetted Shapes. There is an alternate Match 3 game available and there is an achievement for playing a Match 3 game instead of the HOP. The Mini-Games are fairly creative and although I still have the 4th Chapter to complete, I haven't come across a lot of my nemesis puzzles where "selecting one may affect others" which this dev is famous for at times, so I appreciate that immensely. In the Custom Mode Difficulty setting, you can opt to have the Mini-Games start out in an Easy or Hard difficulty mode, however, you can always select the opposite for each one, once they pop-up. I love this feature, I always start out in the Hard Mode, and if it's mind-boggling, I simply switch to the Easy mode (the hard mode usually involves my aforementioned nemesis style) Below are brief descriptions of some of the games (describing the easy mode instructions) that you'll encounter during the demo as well as shortly after: 1-Place gears in a watch correctly (w/in HOP) 2-Click partial images to replicate the spider as shown on the clue. 3-Rotate tokens to complete the path of blood flow. 4-Use directional arrows to repeat the eye movement x3. 5-Select the exact match for each highlighted token. 6-Swap symbols to match the symbols on trace paper. 7-Position the skeleton's limbs & head to match the position shown. 8-Memorize & select the Crossbow card to attack & the Shield card to defend. 9-Choose from 3 paths at the correct time to avoid the sirens. 10-Play poker with skeletons by completing the pattern x3. 11-Use directional arrows to rotate tokens to the correct slots. 12-Swap pyramid sections to stack correctly onto the middle post. 13-Rotate arrow to the correct numbers, the Triangle & Square adjust the # of spaces the arrow moves. This Collector's Edition version has 14 Wallpapers, 15 Concept Art pictures, 29 Movie Cutscene Videos, 5 Music Soundtracks, 22 re-playable Mini-Games, 18 re-playable Hidden Object Scenes, 33 Achievements to earn, 15 Collectible Monster Pictures,15 Collectible Newspaper Article Interviews, 71 Hidden Film Rolls to buy 15 Boudoir Items, (note: you can disable Icon Alerts for the collectibles in the Custom Settings) 4 Main Chapters +Bonus Chapter (very long chapters, extremely long BC) Enjoy the Halloween Hunt! Rated 3 out of 5 by mccurdynk from It was OKAY Graphics, visual and sound were excellent. 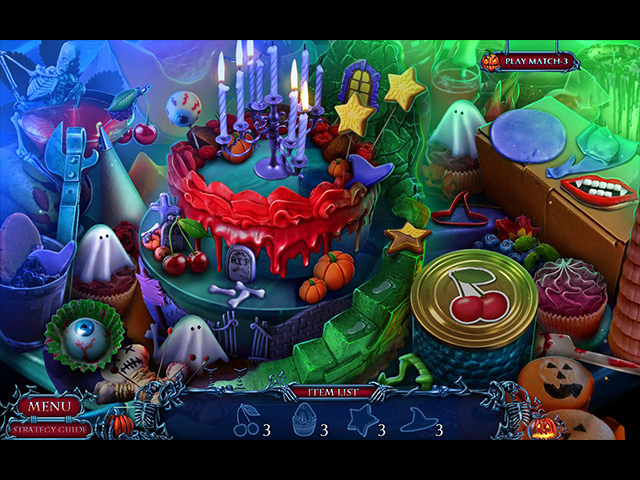 The Hidden Object puzzles were different - so refreshing. But the game was same-o-same-o. It had you hunting around for the dumbest items to complete a task. Too much running around for nothing. Ending quick - which I really liked. But this is one game I started to just skip mini-puzzles. Sometimes they just did not work the way they were supposed to. Rated 2 out of 5 by eric72 from mostly the same Another series by this dev , and i tried it to see if things have improved. Some have : there is an effort to present HO scenes and mini-games with some creativity at times , the animations seem to be better , and the music is not bad. For the rest : it is the same garish palette of colours , and there is no gripping atmosphere , progression , and storyline, no important substance to incite to continue till the end. Rated 2 out of 5 by MissAbby from Getting the Green Vapors This game boring and repetitive. Far too many simple puzzles. Ridiculous "storyline", if you can even call it that. Another no buy for me! Rated 2 out of 5 by cathybobcat from A CURE FOR INSOMNIA Could not bring myself to finish the demo....and for the first time, I quit in the middle of one of the most boring hos ever. Too many story type hos, poorly done.....too many mini games...too much collecting of inventory for senseless tasks... And a ridiculous, juvenile, uninteresting, slow moving story. This appears to be intended for younger players. The only positives I can say about this horrible demo are the graphics and uninstalling it. Rated 2 out of 5 by lala4home from Boos all around but not the way they intended I'm really puzzled at the positive reviews of this game. It's pretty awful. It steals storylines from Potter (the mirror of Erised), Pinocchio (Evil Master, make me a real boy) and even Twilight (I'm chaaaaanging). So an incohesive story that's a real mess. But, although I'm a story person, and I really want the story to be plausible and engrossing, I'll still play a game to the end if the gameplay is good. Not the case here. Easy to the point of immature. So I dumped the demo. I found it that tedious. Sorry, developers. Rated 1 out of 5 by LunaNik from They blinded me with fluorescence. They failed at chromatology. I would dearly love it if devs would realize that they're not making games for tweens, but for adults. Both storyline and gameplay were insultingly juvenile. As a graphic designer, I find the palette repulsively garish. Apparently, the lead has lost his affinity for blurple, and lime green is now his favorite oversaturated color. Have a look at the second screenshot. Yikes. Worse, each group of items in that HO scene consists of three of the exact same graphic. Some are flipped, rotated, or changed in size, but the same graphic was used for all three. Look at the ghosts, pumpkins, cherries, witch hats, and stars. Talk about lazy and cheap. The gameplay was as childish as the storyline. All filler, no thriller. Simon Says, swapping tokens, pattern matching, you know the list. We've done them a million times. For years, I've been saying that devs reuse graphics and subroutines. This game is proof. Devs are just releasing remixes of their previous work with the same mini-games every time. I see no reason to shell out my hard-earned cash for gameplay I already own. Nor do I see a reason to apologize for a negative review that is factual. If BFG's Ravenhearst story arc is five stars, this game doesn't even deserve one. Rated 1 out of 5 by Majestyx12 from Ugly characters I didn't like the game play. I didn't like the characters.